As sure as an absolute nailed on score draw as you're ever going to get, but still, I've got this nagging doubt we should have won this. Ah well, I'd have took a point before the game against a very good Swansea side, so all's fair. Swansea are a lot like Forest used to be, nice passing, plenty of movement, lots of free space and absolutely toothless up front. 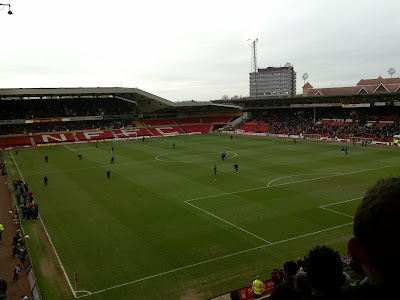 Forest now are a different team to the one that capitulated in Wales last August. Moussi & Osbourne bossed the centre of midfield, Cohen bossed, well, everywhere. Even Joel Lynch looks like a decent player. I'm not too sure whether this is just improvement from a starting position of being one of the worst players I've ever seen in the Garibaldi, but long may it continue. So, a good game in nice conditions and a fair(ish) result. So, what the f**k do the three people two rows behind me have to moan about constantly from 2:40 through 4:55 ? The manager doesn't know what he's doing, he should be making a substitution, go on make a substitution, make one now. No, not now, what are you doing ? Kelvin Wilson gets a lot of stick, but constantly, and from so far away that he can't possibly hear it. Yet the three gormless monkeys bang on at him like he's sat next to them, he can hear every word. If he could hear every word, the chances are they wouldn't be shouting it. Yet most of the vitriol is aimed at Paul Smith. Our keeper certainly divides opinion, some (like myself) regard him as a good shot-stopper and that that alone makes him a good option. Others believe, and I can't disagree with them on this, that his command of the area could improve. Lee Camp came in and basically earned himself almost Clough like status for one penalty save against the sheep in November, and he is seen as the way forward. To the three behind me, he can't do right for doing wrong. Kick it, kick it, kick it. Why have you kicked it you ****. While everyone else is on their feet as Smith makes a save low near the post, these morons are complaining that he hasn't held on to it. And then launched it 80 yards straight on to someones toes. Preferably his own, before he sidesteps 18 defenders and sticks one into the top corner from the middle of the Market Square. But then they'd probably still moan about his goal celebration.